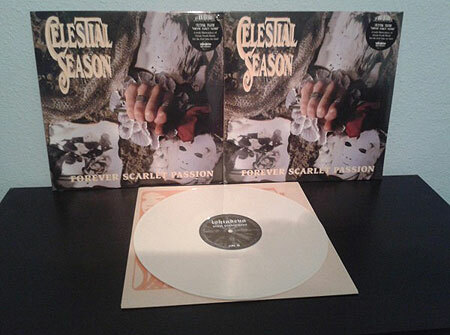 ‘Forever Scarlet Passion‘ was the first album released by Dutch Doomsters CELESTIAL SEASON far away in 1993. This great band was hailed as one of the pioneers of Doom / Death Metal alongside ANATHEMA, PARADISE LOST & MY DYING BRIDE. Now and 19 years later, Ishtadeva Vinyl Productions presents, for the first time on vinyl, this unique masterpiece full of melancholy and desperation. The first edition was released back in August which has now nearly sold out, and the second edition has maintained the original cover but the back cover and inserts have been reworked, details of the two pressings are below.